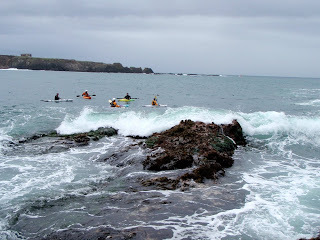 Liquid Fusion Kayaking: Mendocino Coast Kayaking ROCKS!!! Our new and improved Liquid Fusion Kayaking website is up and running. 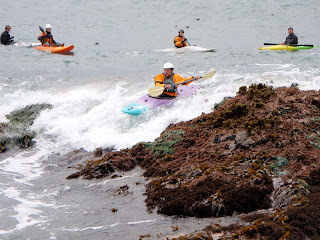 On Saturday, we managed to get out for some paddling fun with some friends from Humboldt County as well as some of our local Mendocino Coast kayakers. 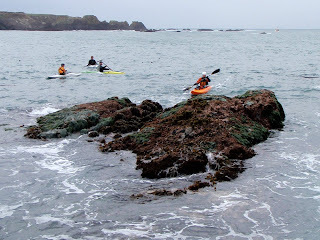 The "short boat" revolution on the Mendocino Coast continues as we show our "long boat" sea kayaking friends the funness of ocean rock gardening with "short boats" - whitewater and sit on top kayaks. We are continually amazed by the playground that is in our backyard. 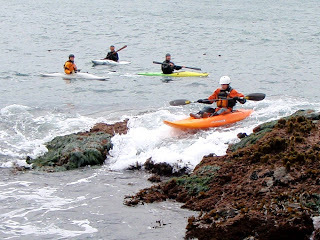 We love kayaking in Fort Bragg's Noyo Bay. It is clos e to home, Bear and Aften (our dogs) love the leash free beach, good food is close by at Silver's, and we have a playground of rock garden features (rocks in the ocean that we can paddle around, through, or over and that often create whitewater, waves, and currents with the swells and surges of the ocean). One day Jeff counted 30 different play spots. We compare our Noyo Bay to a skatepark. Like skaters, we rally our friends, don our protective gear, and seek to perfect our moves and create new ones as we play and interact with the features. We marvel at all that the Noyo Bay has to offer in such a small area - sea caves, gigantic rocks, rock reefs, a few nice surf waves, pour overs, surge channels, and amazing beauty. The wildlife is all around us and doesn't pay much head to our antics. Occasionally we will have harbor seals following us about and watching with amused curiosity as we seal launch and slide on the rocks. Creativity is a large part of ocean rock gardening. It is fun to experience with friends as each has their own paddling style and interpretation of the feature. We enjoy taking seasoned paddlers with us as well as adventurous first timers. Again, it is like a skatepark with features for all skills and abilities and the opportunity to be inspired and awed as the skilled "Go Big." For me, it is fun to play and explore my creativity as a kayaker but also to share the experience through my photos and videos. I hope that you enjoy them.